Here's my new pedalboard I put together this last week. It came about because my wife and I have been invited to join the team that will launch a new church in Bratislava, Slovakia's capital city, some 330km (200 miles) away. To keep things compact, I will use the electro-acoustic parlour guitar I bought from Richard's Guitars through just two pedals - a Bodyrez (a lovely one-knob compressor and EQ) and a reverb pedal, straight to the PA. I made the pedalboard from a piece of hardboard I had lying around with added velcro and strips of rubbery door seal for feet. Miriam, my wife, does indeed play; she is a piano player and teacher. In the photo we were performing together at her school's end of the school year concert in 2016. We play regularly (twice a month) in a local group where Miriam plays keys and I play drums alongside a guitarist, a bassist and a trumpet player. You are right, Nick, 200 miles is a hike and a commitment but it will be just once a month for now. It has me intensively transcribing and learning songs on guitar which is great. That sounds wonderful. How ideal to be able to play in a duo with your wife. I think you’re truly blessed. My wife plays saxophone (just passed grade 8) but we don’t play together too often. We keep meaning to change that, but one day we will. It’s all about time, priorities, all that stuff. Yesterday I was messing about with playing my parlour acoustic through this new little pedalboard and into an Alto TS110 powered speaker and had an idea for a DIY soundhole plug (based on those rubbery covers to reduce feedback problems) as the only ones I found online do not ship to Slovakia. This morning I had some free time so I set to with stuff I have lying around the flat, starting with a piece of foam, from which I cut an 80mm circular piece. I then covered that with a piece of an old black t-shirt, not that it looks black in this photo. ... and this is how it looks with the plug in place. 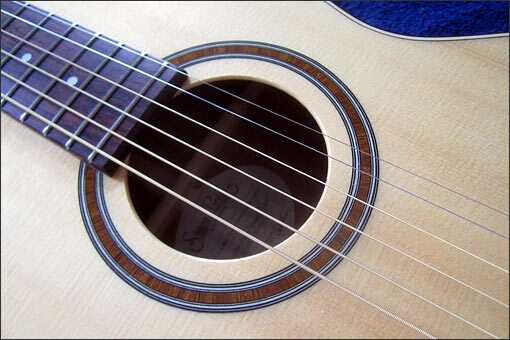 This is how much it protrudes above the soundhole; it sits just a bit lower than the fretboard. I like the new sound, with less treble coming from the guitar itself while the reverb pedal adds treble and the FRFR speaker leaves the acoustic to sound more natural. It feels like I have a hybrid guitar, by which I mean I can now play it as I would my electrics and yet I still end up with an acoustic sound, albeit enhanced by having a compressor and reverb added. 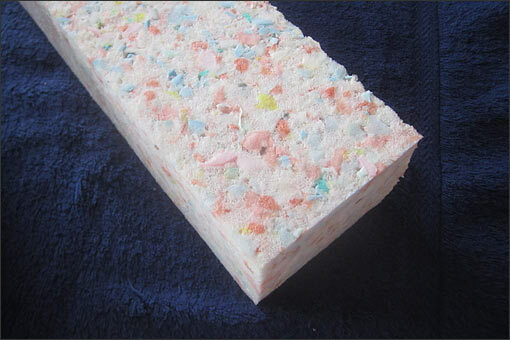 I will have to wait a fortnight until I start using it live to really know how well it works. In the meantime, back to transcribing songs I need to be learning. That looks like a fantastic solution, well done. The forum seems so quiet that I thought I could add a bit but as it is not strictly only about my new mini pedalboard I have renamed the topic and moved it to personal diaries. 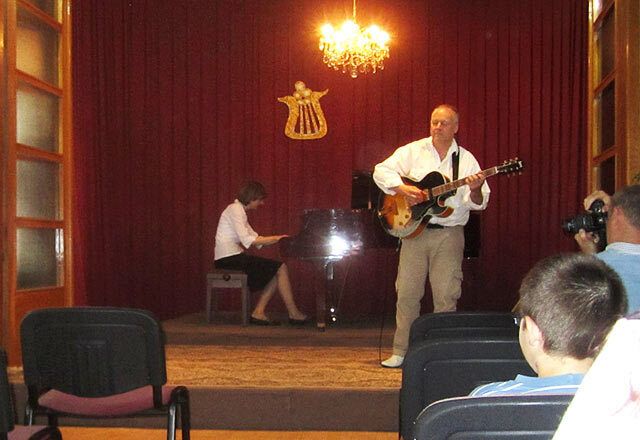 Sorry about the photo not having my guitar in it, or even better, of my wife and me playing. I also thought that Megi might like to see our Alto powered monitor, one of a pair. 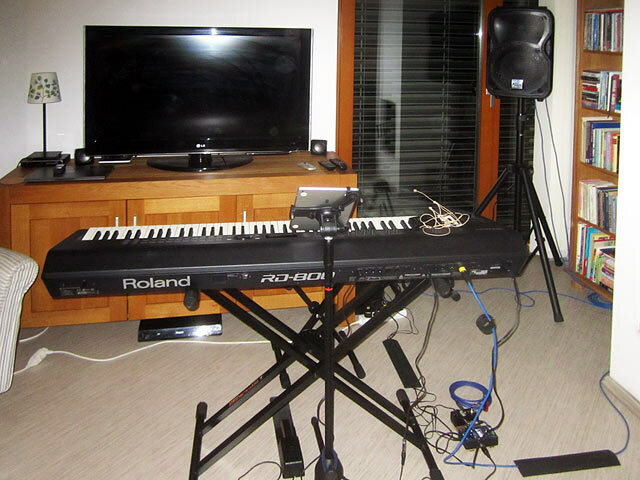 To keep our rig compact my sound goes guitar > pedals > through the keyboard's aux input and together the two instruments into one channel on the monitor, with my wife's head mic using the other channel. A new gig is always exciting even if it is a bit unusual. I don't know about anyone else here but I have never been part of a team that starts a new church so that adds a whole extra dimension to it being a new gig. Yesterday we met in someone's house for a trial run-through. Next month we will be meeting in a building that we might rent so that will give us different acoustics to contend with. 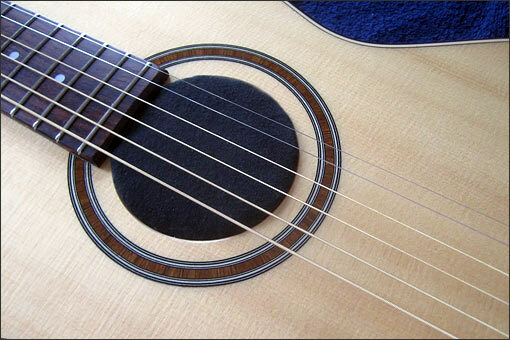 I really like the sound of my guitar with the sound hole plug, even on its own, acoustically, but especially live, with the blend of the guitar acoustically and the amplified wet signal. 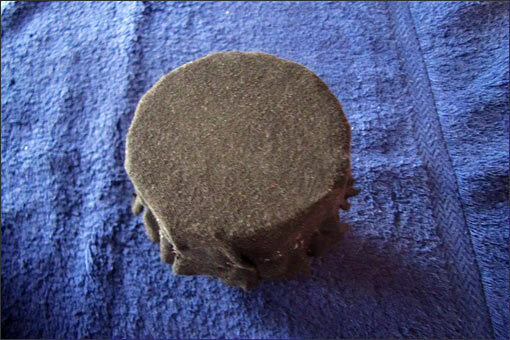 The foam plug is as deep as the guitar - something I did on purpose so that I would not keep accidentally dislodging a short plug and losing it inside the guitar. 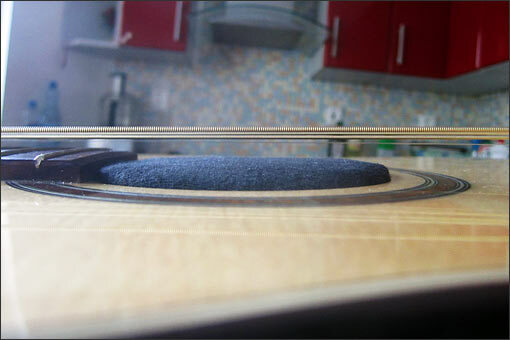 I discovered that it worked far better as a feedback buster than my rubber soundhole cover does on my full size acoustic. The forum has been very quiet of late it's true - but this is good stuff, and thank you for posting it all Lester. Lovely work with the sound hole feedback reducer. Also, I do admire your purposeful, compact, to the point pedal board, and live setup - indeed with the great Alto monitors. I'm still using mine, just for guitar, quite happily. Not so long ago a band I was in was after some PA speakers, and I tried to sell them on the good value/benifits of Alto, but they went for dB Technology Opera 15" no less instead. Which are fine, but I suspect the Alto 12 or 15 inch would have worked just as well. I don't have a lot of experience playing in churches, but have done concerts in a few - one thing that has stayed with me regarding the older/traditional churches is that there's no need for reverb! Indeed, I couldn't even detect any difference at all with the guitar amp reverb turned up or down, such was the dominance of the church acoustic. Another gig was a couple of charity concerts in a modern, carpeted church space - the reverb more useful there, and I was most impressed by the sound setup they had, with expertly managed mixing desk at the back of the hall. 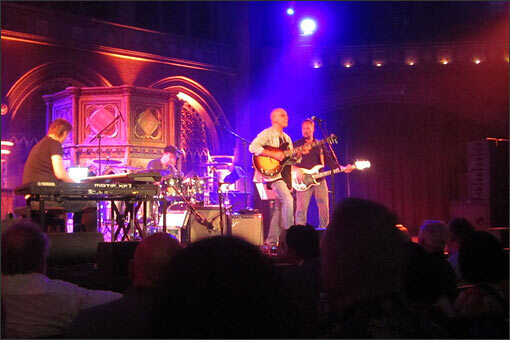 Larry Carlton played at Union Chapel in Islington, London (in 2017), a regular concert venue. The interior is mostly wood. The sound team were terrific at getting a good sound and the band were the pinnacle of freelancers: I noticed that Larry mostly gave signals to the bassist who was the musical director for the group. All the musicians had opportunities to show their stuff and Larry mentioned that they had only managed an hour's rehearsal together that afternoon. Larry played his number two 335 which stays in Europe and told us how his number one will never leave the USA. I guess our experiences of church playing are where there is less than a capacity crowd, a smaller budget for the PA and, often lots of reverb. I have played in churches where it is obvious the architect never intended modern instruments to be played there - just a traditional choir - and, as you mention, some newer or refurbushed places where the reverb is more under control.